When the people resist, the rulers attack. And when movements of the people raise fundamental questions about the nature and legitimacy of that system—and provide leadership to overthrow that system and bring into being a whole better world, as Joey Johnson and the RNC 16 have done, the rulers attack ruthlessly. The response must be to fight against these attacks every inch of the way, further exposing the nature of the system and bringing forward more and more people to defend the resisters and to resist themselves. 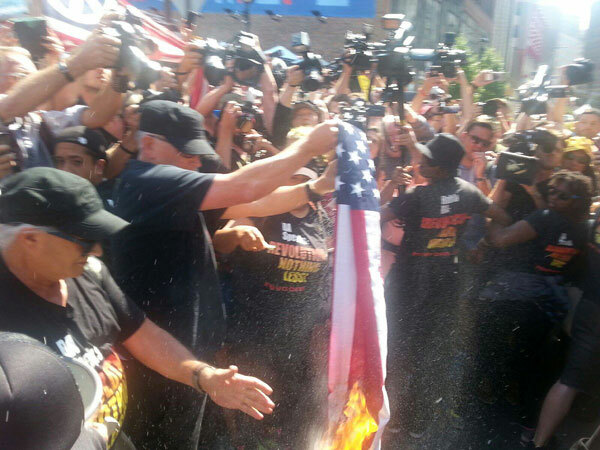 Joey Johnson with the support of the Revolution Club burned the American flag outside the Republican National Convention to protest the toxic chauvinism and reactionary ideas of all stripes surrounding Trump's nomination. Joey Johnson said, "We're standing here with the people of the world." On January 26 in Cleveland, in a courtroom packed with the RNC 16 defendants, attorneys, supporters, and several media outlets that came and recorded the entire hearing, the arguments for the defendants’ motion to dismiss all the misdemeanor charges against the RNC 16 were heard. 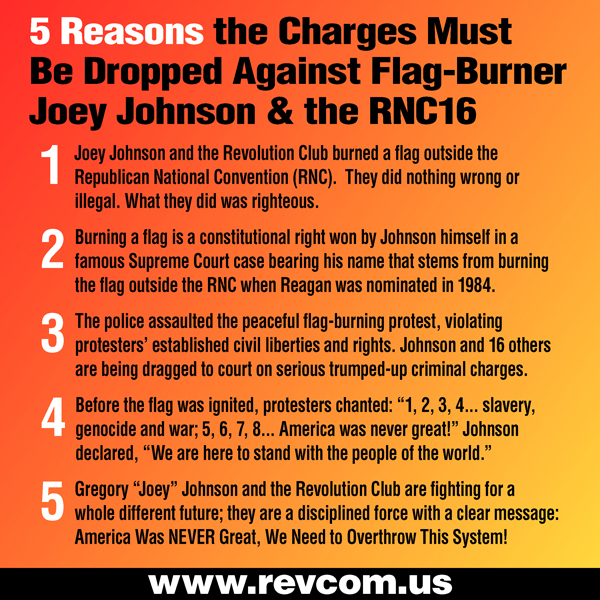 The RNC 16, along with Joey Johnson, were arrested and charged off of the burning of the American flag at the Republican National Convention (RNC) last summer that nominated the fascist Trump. The attorneys for the RNC 16 presented a compelling case as to why the charges should be dismissed. This included putting Cleveland Police Chief Williams and a police lieutenant on the stand. Both of them had been subpoenaed by the RNC 16 attorneys to appear in court. They testified with their “alternative facts” and spun their outrageous and at times ridiculous lies and justifications for the illegal, pre-emptive, brutal assault and arrests of the defendants. This was challenged and exposed throughout their testimony, with the defendants’ attorney using the Cleveland Police Department’s own documents regarding political protests during the RNC, along with the CPD’s own audio tapes and written police reports, to impeach their testimony. Further revelations came out in their testimony about the surveillance of the Revolution Club before and during the RNC. As a surprise witness, Joey Johnson testified, refuting the lies of the police. After Williams’ testi-lying, the attorney for the defendants stated that the “chaos” Williams attempted to blame on the defendants for that day was a product of the illegal actions of the police who were rushing in their attempt to prevent Joey Johnson from burning the American flag. Late the night before the hearing, several cars arrived in Cleveland, packed with some of the RNC 16 and other Revolution Club members who had been in Washington, DC, days in advance of the inauguration of the Trump-Pence regime. They had been marching all day and all night—saying “No! In the Name of Humanity, We Refuse to Accept a Fascist America” and calling people into the streets to stop this regime from coming to power. On the day before the Cleveland hearing, they had participated in the protest in DC outside the court appearances of those who were arrested for disrupting Congress at the confirmation hearing for the white supremacist attorney general-select Jeff Sessions, demanding all those charges be dropped. Then they jumped into the cars to head for this important hearing in Cleveland. The day was kicked off with the RNC 16 and supporters chanting and marching in front of the Cleveland INjustice Center courthouse before going in to court. There was an air of anticipation as well as seriousness as the defendants and supporters came into the courtroom with the understanding that this hearing (as well as the continued prosecution of the two RNC defendants facing serious felony charges) is one of the first legal challenges under the Trump-Pence regime to the criminalization of political protests, and in particular flag burning as a constitutionally protected expression of free speech. This hearing was coming on the heels of the prosecutor being forced to drop assault charges against Joey Johnson and one other RNC defendant just two weeks prior. While awaiting the necessary conditions to go all-out for revolution, we need to hasten this and actively carry out the“3 Prepares”: Prepare the Ground, Prepare the People, Prepare the Vanguard for Revolution—Get Ready for the Time When Millions Can Be Led to Fight, All-Out, With a Real Chance to Win. We need to Fight the Power, and Transform the People, for Revolution—protest and resist the injustices and atrocities of this system, and win people to defy and repudiate this putrid system and its ways of thinking, and to take up the outlook and values, and the strategy and program of the revolution, build up the forces for this revolution, and defeat the attempts of the ruling powers to crush the revolution and its leadership. With every “jolt” in society—every crisis, every new outrage, where many people question and resist what they normally accept—we need to seize on this to advance the revolution and expand its organized forces. We need to oppose and disrupt the moves of the ruling powers to isolate, “encircle,” brutalize, mass incarcerate and murderously repress the people who have the hardest life under this system and who most need this revolution. We need to “encircle” them—by bringing forth wave upon wave of people rising up in determined opposition to this system. The hearing opened with one of the RNC 16 attorneys, Michael Murray, arguing on behalf of all the defendants, stating the purpose and aim of the decision of Joey Johnson and the Revolution Club to go to the entrance of the Republican National Convention on the very day that Donald Trump was being selected as their presidential candidate to burn the American flag was based on their “strongly held views about society and the RNC,” and he repeated for the judge the chant they did before and during the flag burning: “1, 2, 3, 4, slavery, genocide and war. 5, 6, 7, 8, America was never great!” He stated the timing of this action came at the most important juncture in the nation, for the Republican National Convention and Donald Trump, and the defendants had an extremely important message they wanted the world to see. The first called to the stand was Cleveland Chief Pig Williams. After being shown key documents outlining the policies and procedures prepared by the CPD as well as other agencies to ensure the rights and safety of those who wanted to conduct constitutionally protected political protests, including flag burning and the responsibility of the law enforcement agencies in carrying this out, Williams arrogantly declared that all his officers as well as all the other law enforcement agencies who had come to Cleveland in their thousands, went through extensive training and were fully aware of these policies, including that flag burning is a constitutionally protected free speech expression. In response, Murray showed him the press release announcing Joey Johnson’s intention to burn the flag, and asked what preparations were made by the CPD and other agencies to ensure Johnson’s ability to carry out this political protest safely and successfully. Williams denied knowing in advance about this flag burning, declaring that had the CPD known, he would have ensured that Johnson would be able to carry out the flag burning safely. When confronted with the police report written by his lieutenant stating: “Open Source information was forwarded to officers working the crowd management detail warning that members of a group that identified themselves as ‘rev.com’ were advertising a flag burning to take place at E. 4th and Prospect at 1600 hours,” Williams could only say he was not aware in advance of this action. As to why these defendants were arrested, Williams stated that when he arrived on the scene after the flag burning, “there was total chaos,” so he declared the scene an unlawful assembly and issued an order for everyone to disburse and that these defendants failed to comply with that order. When Murray asked him to describe who was in the area at the time the dispersal order was given, Williams stated that there were hundreds of people, citizens and media. When asked if all those other people left after the dispersal order was given, Williams would not say, stating there was lots of media and he couldn’t tell the difference between people and media, thus admitting that there were many people who did not comply with the dispersal order. At that point it was clear to everyone sitting in court that the only people arrested and facing charges arising from this flag burning were those singled out by the police and other law enforcement agencies for participating in the flag burning. The CPD lieutenant was called to the stand, and after testifying that he had reviewed and been trained under all the guidelines that Williams testified were in place for the RNC, this cop was then shown the supplemental police report he wrote the day after the arrests, which included the above-referenced statement shown to Williams. He stated that he was aware that Joey Johnson was planning to burn the flag at the announced time and place. He also confirmed that he had written in the same report: “Open flames and burning of any sort were deemed prohibited by the City of Cleveland in the RNC event zone.” Based on this statement, he decided that the flag burning should be stopped. He admitted that he went to the location and “as soon as they began to and lit the fire” he went in to extinguish it. Murray then introduced into evidence and played for the whole courtroom the video of the flag burning, which clearly showed him (in the white shirt) pushing through the crowd and the Revolution Club’s safety circle, as he attempted to stop the flag burning even before the flag was set on fire. Up until then, the safety circle had been secure. As Murray stated, the safety circle was collapsed by the actions of the lieutenant and the dozens and dozens of other cops from various agencies who charged in, brutally assaulting and attacking the protesters. The lieutenant pig also admitted in court that the CPD immediately began following the revcoms as they headed for the location of the protest. (As you can see from the video, the revcoms only put on their distinctive black BA Speaks: Revolution—Nothing Less! shirts when they arrived at the RNC entrance as they formed their safety circle.) When asked how the CPD was able to identify the revcoms while they were en route, he stated that they were “advised by undercovers who pointed them out.” When questioned by Murray as to who were these undercovers, he stated that “these undercovers were mostly CPD,” and went on to admit and acknowledge under questioning that there were many other police agencies involved, including the FBI and Secret Service. Earlier, Chief Pig Williams admitted that the revcoms were very well known to him well before the RNC, from the end of 2014 (Williams became the pig chief in 2014), and that in the CPD preparations going into the RNC, the revcoms were discussed. Following the filing of post-hearing briefs, the judge will render his decision. After the hearing, several media outlets interviewed Joey Johnson.